Well, it's back to work for me! After long consideration and discussion (about two months long) Hanna and I decided that it would be best if I went back to work and she stayed home with Sophie. Originally, our plan was to have Hanna continue working at Remedez while I was still in School, and we would juggle the baby. Eventually, we decided the baby was too delicate to be juggled and our lives would be much simpler if each of us could tackle a priority head on. So Hanna left Remedez, which a sad day for Hanna, but I think she's gotten over it pretty quick. The job at Novell has been quite the opportunity though. It's in the Internal Audit department and couldn't be more perfect for me at this point in my life. I first heard about the job at a friend's Marine Commissioning, to be honest. I ran into one of the current interns at that time, and somehow we got to talking about accounting and how we were both in the program. He told me about the position and how an opening was coming up in the Summer, and here we are! I was actually quite nervous during the interview process because of the competition for the job and simply how great of an opportunity it would be. But everything worked out for the best and on Wednesday of this week, I started working. The position has me responsible for assisting the Director of Internal Audit and the Audit Manager in the documentation, testing and evaluation of internal controls and business procedures. We conduct research, perform analyses, flowchart processes and maintain a SOX database (Access database). The position actually mostly revolves around maintaining this SOX Database for the company and assisting in the SOX audit performed by external auditors. In fact, this Summer we're going to redesign and deploy an entirely new database, and I will be able to be a part of that project. There are only two Internal Audit Interns there at a time and the position is usually a two year gig. The interns also perform a variety of operational audits and side projects. All in all, I feel like I am going to be learning so very much and I couldn't be more thrilled for the opportunity. The great thing about the job is how perfectly it prepares me for what I want to be doing. I couldn't ask for a better job to help me prepare for Public Accounting, and the opportunities to advance my IT and Information Systems knowledge are abundant. Anyway, both Hanna and I are quite excited about the new change and are sure it will be for the best. 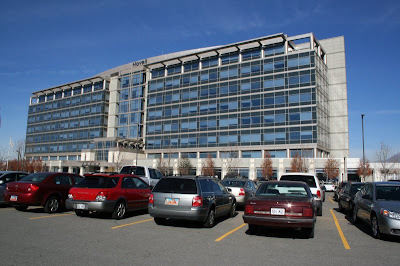 This is a picture of the building I work at. My office is on the 4th floor. Congrats Tracy! We are so happy to hear about this wonderful opportunity for you and your family. So even though I just read and reread that, I have no idea what you are talking about-- but congrats! I'm sure you'll be great at whatever it is you do :) We're proud of you. Tracy and Hanna, we (Ryan and I) are so happy for you! What a great opportunity for BOTH of you to do great things! The pictures of Sophie from Kiddiekandids are incredible too!